Eleven UN Security Council (UNSC) members voted in support of the Malaysia-proposed draft resolution, with Angola, Venezuela and China abstaining. This was enough for the resolution to pass, but Russia applied its veto right as a permanent UNSC member. The vote was preceded by Security Council Chairman and New Zealand foreign minister Murray McCully announcing a minute of silence for the MH17 tragedy victims. Despite the veto, Moscow is ready to assist the investigation into the reasons for the Malaysian Boeing 777 crash, Russian UN envoy Vitaly Churkin said. “Russia stands ready to cooperate in the conduct of a full independent and objective investigation of the reasons and circumstances of the crash,” he said. The Russian envoy also stressed that Malaysia and its backers submitted the resolution already knowing that it would be vetoed. “This, in our view, indicates the fact that political purposes were more important for them than practical objectives. This of course is regrettable,” he said. “It is difficult to explain how the event, which wasn’t considered a threat to international peace and security a year ago, now suddenly becomes one,” he wondered. The Russian envoy also pointed out that there were no precedents of the UNSC creating an international tribunal to bring justice to those responsible for a transportation catastrophe. The expertise of previous international tribunals on “Yugoslavia and for Rwanda, can hardly be considered successful in view of their complexity, susceptibility to political pressure, high cost and extremely long proceedings,” he added. “Efforts to deny justice only intensify the pain of the victims’ families, who have already endured more than any of us can fathom. It is the effect of Russia’s veto today,” she said. Aviation incidents, even as murky as the downing of MH17, are not normally a matter for the UN Security Council to tackle on its own, international lawyer Thomas Sima told RT. “The question is, ‘Why does the UN see the need to take over something that is already being handled through other channels?’ And the only reason that I can think of is that the real reason is political,” he said. The tribunal resolution on MH17 was pushed by Washington because it wants to have control over the proceedings, which is not the case with the ongoing Dutch investigation, believes Paul Craig Roberts, a former Reagan administration senior official. “Well, Washington is able to block the [Dutch] report, but it’s not able to completely falsify it. So it has now turned to the UN. It wants a new investigation, one that Washington can control,” he told RT. Before Wednesday’s vote, Moscow had openly stated that it would prevent the Malaysia-proposed document from passing. Russia warned that the tribunal would lead to even more confrontation in the international arena as it is intended to assign blame to those who Washington wishes to finger as responsible for the crash. The Russian side noted that although the MH17 downing was a criminal offense, it was not a threat to global security. Dutch investigators looking into the MH17 tragedy said that the plane was shot down while flying over the conflict zone near Donetsk. However, they have not yet established responsibility for the tragedy, as pro-Kiev forces were engaged in combat with rebels from the self-proclaimed republics in eastern Ukraine at the time. The Ukrainian authorities and the West blame the Donetsk militias for downing the plane, saying that they used a Buk surface-to-air missile allegedly provided by Russia. The rebels deny these accusations, and Moscow has repeatedly warning against putting blame on anyone before the investigation into the crash has been completed. The Dutch Safety Board that has been heading an international investigation into the cause of the crash is due to release its official report in October, while the criminal investigation is expected to continue until the end of this year. A draft resolution submitted by Malaysia proposed the establishment of a tribunal to investigate the incident, with judges and the prosecutor to be appointed by the UN Secretary General. The document also called on member states to adhere to the 2014 Resolution 2166 and provide maximum assistance to the international investigation into the incident. 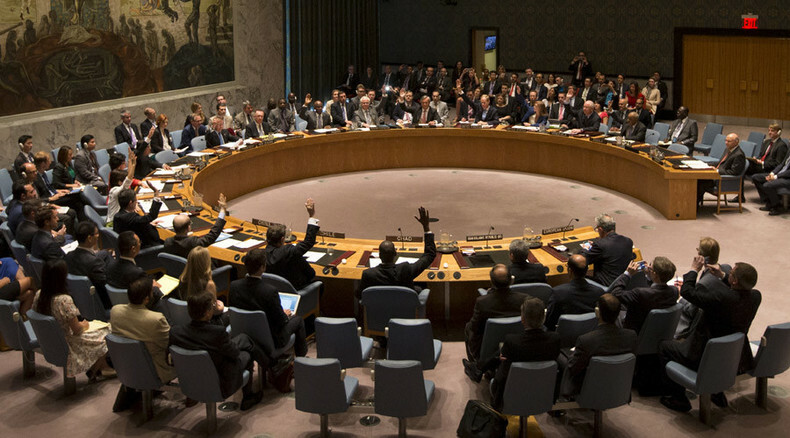 The draft was supported by several nations in the UNSC, including the Netherlands and Ukraine.